Hi guys, just thought I'd start a thread to share my analysis, and see what your take might be. On the chart above, you can see the various lines I see as likely outcomes for the intended target, and the paths to get there. Currently, we've seen a tremendous amount of resistance on the head of a bullish channel (these are marked in red), and why it's been an incredibly difficult resistance for bears to break. A successful break opens the doors for 3500 - 3700 territory. The powers that be may not want to see us reach these price points. 1) They have a lot of capital which would see significant devaluation (unable to liquidate as it would only bring the price down). 2) It would completely destroy public sentiment on Cryptocurrency, which would leave a bitter taste for many (as if it hasn't already). Mind you, I'm referring to the market makers -- the big exchanges -- the ones driving manipulative spikes. On the other side of the coin, you have investment firms, and traders -- with a lot of capital -- who are not satisfied by these entry points, particularly as it has not reached its bottom, in a market not ready for a bull run. These players have a hand in the swings and lows to local maxima and minima. They're comfortable driving the price up to certain highs, liquidate their holdings to amateurs while sustaining the price, and short as we head towards the bottoms. A few days ago we saw a short squeeze to reach the top of a bullish support line, only to be epically rejected. There's a few outcomes we can see unfold in the next 3 days. 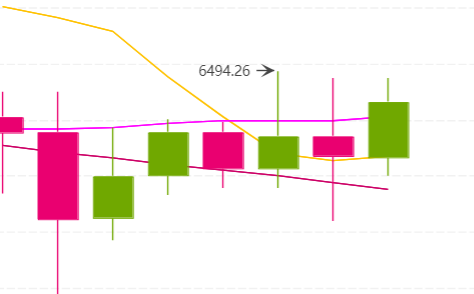 Bulls succeed: they break through 6900, which would send us flying to 7400 territory, and possibly to 7900 (from record-breaking short closing) before the downward descent. 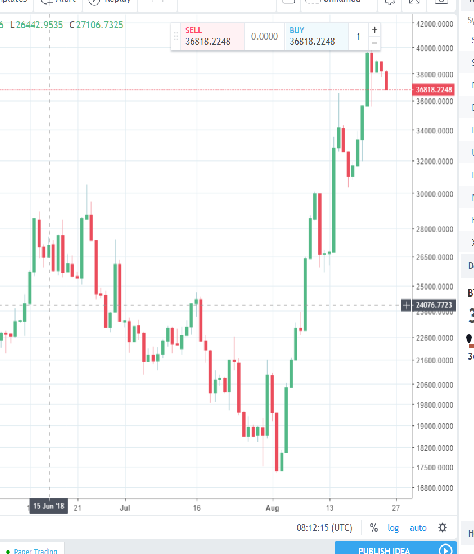 Bears succeed: they break through this final resistance point of 6300, and a failure to bounce back immediately, trading below 6000, would bring us to a new realm where 3700 is a possibility. You can see this struggle unfolding on the 4 hour chart: . A successful break brings us closer to one of these outcomes. As mentioned in a previous thread -- there's an attempt by bulls to invalidate the head and shoulders set-up, while bears are determined to fulfill it. Bulls are attempting to break through 6500, send it instantly to 6700, where the fight for 6900 would ensue. Bears are attempting to break 6300, and open the gates to hell. Judging by the recent price action, however, my take is that bears seem to have full control and we will live in sub-6k territory for a while. Any jump to 6700 could be very short-lived as bears allow the move to increase their shorts. With that said, the freakishly large number of shorts open could see the most dramatic rise in recent history. Thanks for taking the time to provide us with your analysis. Ignore the clowns who surely will spam this thread with their negativity..
Bulls are attempting to close the daily above the resistance line of 6530 to make it a support. Failure by bears to respond in the next hour and a half opens the doors to 7400 +. A close below 6450, would bring the battleground to ~6330. Bears are now proving their dominance, erasing all of the gains from the last bull pump. Expect a close below 6450. If so, next possible bounce: 6284 - 6330 range, where we can expect a possible final attack by bulls to close above 6400 tomorrow. However, they could also concede at this point, lose the resistance, which would send us to 5700 territory. Yep, they closed above 6450. Looks like we may have just broken a key resistance as bulls sustained their channel. Opened long position. 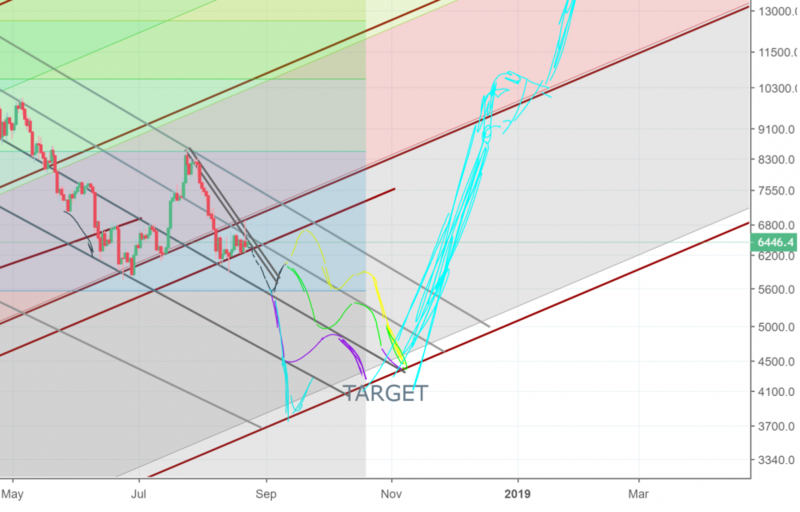 Target 6700 to attack 6900. A break would see a green ***** to 7400. Most shorts are pooping their pants; it's higher than the last pump to 10k. We should see a nice breakout to 6750 soon. Bears are relentless, but bulls held their ground. Post belongs in Alt coin section and not here, thanks. 6750 -> 6900 still in play, even to 7400 - 7900, however, I'm pulling out. I suspect a trend reversal to complete head and shoulders, which would send the price to oblivion (5k territory), irrespective of the number of open shorts. Definitely a no-trade zone. Bulls are pushing through, but when the tides shift, they're the first to run with tails between their legs. Bulls are bears in disguise. Bulls couldn't quite get a close above 6780 - 6800. As soon as we touched that resistance line, many pulled out. Unless they can regain momentum very quickly (possible but doubtful), it looks like the downtrend is on. If so, there's potential for a bounce in 6620 territory, and a bullish reversal, but as I've said before, they're cowards when it comes to defending, particularly as we're still below 6880, and in head/shoulders territory. Like a catching a falling knife, they say. I neglected to look at the time, it's the 9:50 Judas swing. Expect 6800 soon. (My apologies this thread is very spammy, but it's more so for my own historical record). Bulls tested 6650 support, and it held admirably. Market sentiment shifting (based on shorts closing). Expecting a jump to ~6830 before we close daily above 6785. 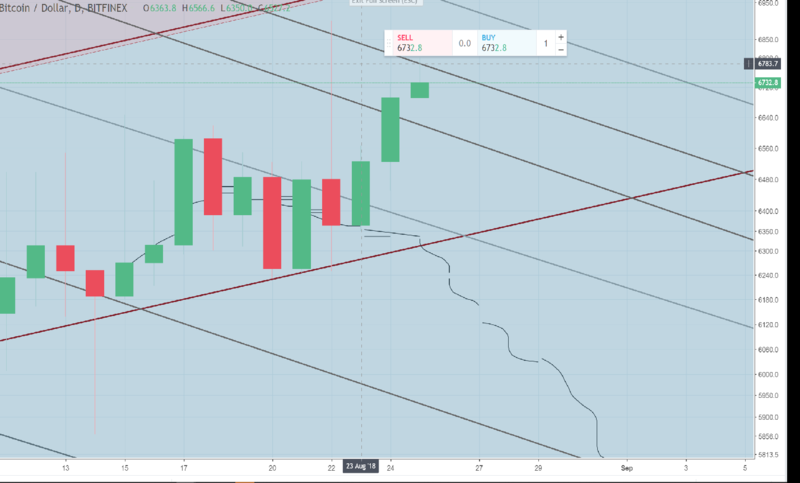 Bulls can easily disintegrate the dreaded 6900 resistance in less than 2 days to, touch 7400, and settle/ re-test the top of their bullish channel at 7050. Re-opening long position. It's an epic bull trap. The second we touch base at 6900, bulls get disintegrated down to 6300, then below to the infamous 5500 number. I no longer find this move plausible. Based on the ridiculous number of shorts opened, how long could this move have lasted? The rush by bears to secure these positions would quickly have undone their work. It was an epic bear trap. Throw around a 5500 number by the media to get everyone to accept this as a possibility. Get everyone accustomed to lower highs, and lower lows. Get everyone and their grandmother to short the market. Create a fake head & shoulders pattern. Push through and liquidate/ force close everyone's positions to destroy the downside/ bear resistances. And you do it on the eve of the weekly MACD turning green to signal the next bull run. If we continue through, we may have just created the first "higher low". If we actually cut through the downside resistance, we could very well be witnessing the set-up for the next bull run. For all of you long-term investors, let's hope the bear trap was in the works, and let's hope we see the largest red line, and drop of shorts in history to shoot us to "the moon". There's a reverse head & shoulders formation, which could see a a shot straight into 7400 - 7600.